Protesters Monday night toppled Silent Sam, the Confederate statue at the University of North Carolina at Chapel Hill . Press accounts  in North Carolina said that the protesters used ropes to pull down the statue after first covering it with banners, one of which said that it was time for "a world without white supremacy." When the statue fell, people cheered. Video posted by The News & Observer shows the scene as the statue was pulled down and protesters celebrated. The action came after years of debate. As many other colleges and universities removed Confederate statues and symbols, UNC officials said that they lacked the power to remove the statue, with the campus deferring to the system, and the system board last month saying that any decision  needed to come from a state agency, and that the system had no plans to ask that agency to act. 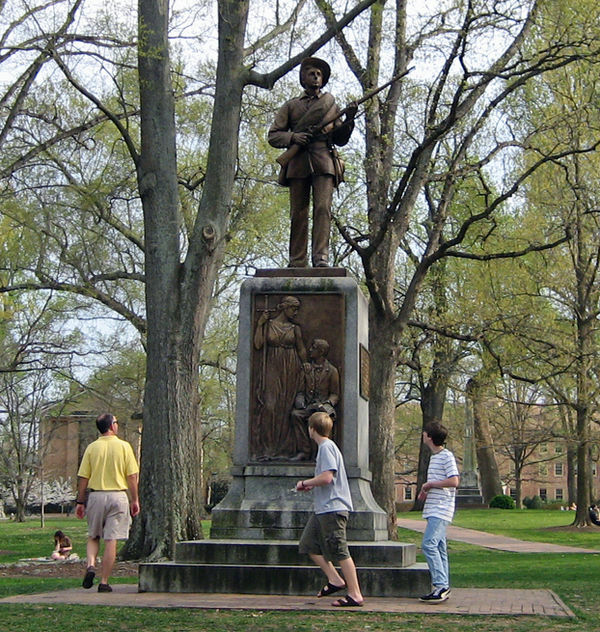 Silent Sam, representing all Confederate soldiers, was put up by alumni and the United Daughters of the Confederacy in 1913 to honor alumni who fought for the Confederacy in the Civil War. The photo at right shows the statue as it appeared on campus. On some campuses, such as the University of Texas at Austin  and Duke University , statues of Confederates have been vandalized (and then cleaned) in the debates leading up to the university decisions to remove the statues . But in those cases, protesters did not take down the statues. Carol L. Folt, chancellor at Chapel Hill, issued a statement  late Monday condemning the protesters. "The monument has been divisive for years, and its presence has been a source of frustration for many people not only on our campus but throughout the community," Folt said. "However, last night’s actions were unlawful and dangerous, and we are very fortunate that no one was injured. The police are investigating the vandalism and assessing the full extent of the damage." On Twitter, Governor Cooper criticized the protest. The North Carolina Division of the Sons of Confederate Veterans tweeted a photo of the toppled Silent Sam with the caption: "This is what injustice looks like in America today!" But many are applauding the protest. Tarik Woods, a student at UNC, wrote a column  for The Daily Tar Heel, the student newspaper, in which he described feeling "hopeful" in the wake of the removal of Silent Sam. "I’ve only lived in two cities my whole life, both in North Carolina and both home to Confederate monuments," Woods wrote. "I have seen the protests and unrest, the increase in racial tensions and the violence they cause. I’ve been asked repeatedly 'what the big deal' is about these statues, and why our society should condemn them. I’ve heard excuses repeatedly for keeping it where it is, such as 'inanimate objects like Silent Sam can’t be racist,' and 'by removing the statue we would be erasing history.'" Woods went on to say why the statue was a big deal. "I strongly believe the most prevalent feeling among my fellow students, including myself, toward Silent Sam is anger," he wrote. "Anger that a symbol of discrimination and hate would be allowed to remain at the forefront of our campus for more than 100 years. Anger that our fellow students were jailed and punished for attempting to rectify this wrong. Anger that our efforts to persuade our administrators, the Board of Trustees and the Board of Governors of this internal abuse was met with further attacks on our fight against injustice." On Monday, hours before the protest, UNC's Center for the Study of the American South, a research and education center, issued a statement  saying that "we cannot lead critical conversations in or about the region if we do not address the controversies on our own campus. As we study the South at the University of North Carolina at Chapel Hill, we are compelled to confront the fact that Southerners are as hostile to one another as we are hospitable. Southerners created the Confederacy, and they also created the civil rights movement. We are now in another moment when UNC’s legacy will be forged in powerful ways that reach beyond the politics of our state." The statement did not condone Monday night's actions. But it said that the failure of UNC to act was "immoral," explaining that "excessive deference to process over people can itself be a form of violence when it makes the obvious solution to end suffering seem impossible." The statement went on to both urge the removal of the statue and to caution that doing so would only be one step needed in the state and the country. "The Center for the Study of the American South recognizes that removing the statue will not, by itself, erase attitudes of white supremacy, eliminate racial violence in our society, provide equal protection to immigrants who enter lawfully, or redress the other injustices that are standing in the way of our nation’s progress," the center said. "Removing a toxic symbol from our campus, however, will free the University of North Carolina to fulfill its promise to facilitate research, knowledge, ideas, and frameworks that do address these problems. Taking Silent Sam down opens the door for reconciliation and will allow UNC to declare itself a true home for all."